California Fires Spare Most Vineyards, But Marijuana Crops Go Up In Smoke At least 30 marijuana farms in Northern California have suffered significant crop losses, while only a handful of vineyards in the Napa Valley experienced significant property loss. A handmade sign is seen attached to the Napa Valley welcome sign on Oct. 16, 2017 in Oakville, Calif. At least 40 people are confirmed dead, dozens are still missing, and at least 5,700 buildings have been destroyed since wildfires broke out a week ago. In Northern California, two intoxicants are king — wine and weed. Both products drive the $3.2 billion-a-year tourism industry in Napa and Sonoma counties. But as wildfires continue to rage through the region this week, marijuana growers and winemakers are struggling to keep their crops safe. At least 42 people have died in the fires, and thousands of homes and businesses were destroyed since the flames first ignited Oct. 8. Firefighters have begun to contain some fires that forced the evacuation of nearly 100,00 people. 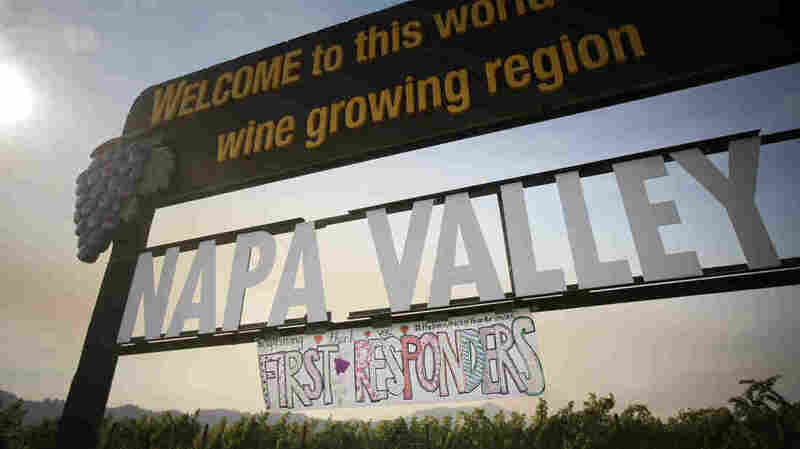 The Napa Valley Vintners Association says 47 out of 330 member wineries reported direct damage and only a handful suffered significant property loss. There are more than 900 vintners across the Napa Valley. But the situation is more dire for the area's fledgling marijuana industry. At least 30 farms had significant crop losses, says Hezekiah Allen, executive director of the California Growers Association, a statewide trade group for the legal marijuana industry. As farmers who evacuated return, those numbers are expected to rise. Many marijuana farmers have lost over a year's worth of work during the busy fall harvest, Allen tells Here & Now's Robin Young. "A lot of folks had plants maybe in their drying sheds, maybe they were in the process of trimming them, of sorting them — a lot of work going on on the farm this time of year," he says. As the San Francisco Chronicle reports, there are up to 9,000 pot farms in Sonoma and Mendocino counties. The region is the biggest driver of California's $21-billion marijuana economy. Cannabis revenues were expected to rise after California voters legalized recreational use of the drug last November. Retail sales are set to begin in January. The industry already has strong roots in California. It was the first state to legalize medical marijuana 21 years ago. Recreational pot is now legal in eight states and the District of Columbia. California pot growers who were living in the shadows for years were preparing to have a legal, officially recognized business, Allen says. Growers have invested anywhere from $75,000 to $1 million to meet new regulations. Allen says insurance policies for marijuana crops are virtually nonexistent. Since marijuana is illegal at the federal level, California growers are not allowed to put the cash from their sales into banks. "We did have one report, heartbreakingly enough, that not only was the home and the crop lost, so was the all-cash savings that the grower had to keep on the farm," he says. "And this is one of those risks of not being able to put your savings in the bank." Pairing Wine And Weed: Is It A California Dream Or Nightmare? California wineries suffered less damage than marijuana farms because most vineyards in the area are located in valleys, which haven't been touched by fires. Vineyards also act as a firebreak, says Jim Lapsley, agricultural researcher at the University of California, Davis. "The way that most vineyards are grown these days is that the ground between the rows will be plowed, so it's open ground. It doesn't have vegetation," he tells Young. The vines themselves have "liquid in them. The water is being pumped through the plant as it's going into the grapes — so they are a natural buffer." Because the fires started at the end of Napa's harvest season, Lapsley estimates that 90 percent of grapes have already been picked. "The real issue for the industry right now is potential damage from smoke on the grapes," he says. "It's possible that the smoke can affect the grapes and the resulting wines with something called smoke taint," which ruins their flavor. The unpicked grapes are mostly thick-skinned Cabernet Sauvignon, according to the Napa Valley Vintners. They tend to be more resistant to smoke taint. The Napa Valley is known for the quality of its wines, though less than 10 percent of California's wine grapes are grown in the region, according to the Agricultural Issues Center at UC Davis. Most of the wine in California's $34 billion industry comes from the Central Valley — a vast fertile area to the east. The real problem in Napa Valley may not be losing grapes, but losing tourists. Road closures and burnt-down hotels will likely keep visitors away during peak tourism season. Lapsley says wine tastings and tours in most of the Napa Valley will still go on. But your wine might taste a little smoky.